As we have found out by examining the purchase of other crypto coins with Paypal like getting IOTA with PayPal. It is not the easiest of tasks. This is due to vendors reluctance to use PayPal as they receive a huge amount of chargebacks. We did however find Virwox, which will help us in the process of buying Cardano through Paypal. Although there are a few other methods of acquiring Crypto with PayPal, we found Virwox seems to be the safest route. Virwox is a leading independent exchange for trading virtual currencies. 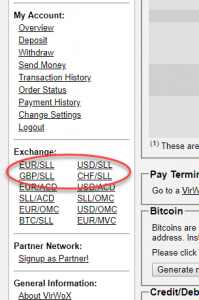 We found Virwox allows you to buy bitcoin with PayPal. So in order to get Cardano, you will have to first buy bitcoin initially and then trade this for Cardano on a relevant BTC/ADA exchange. Go to Virwox and Register a new account by clicking on “Not Registered yet” complete the registration with username and email address. Login and change your password. 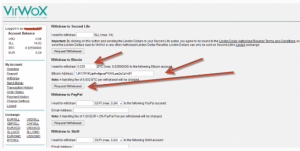 Once logged in you will need to click on the deposit button located on the left. Add funds using paypal. The SLL bough will be used shortly to exchange for bitcoins. Go to the Exchange >>> BTC/SLL and buy Bitcoins with your SLL. If you want the order fulfilled straight away place a ‘market order’, which wll give you the current available rate. However if you wish to get a better rate place a limit order, which will only be fulfilled oncw someone is ok with accepting you offer. Once fulfilled you now own bitcoins. Log back in to your virox account and go to the withdraw section, add the bitcoin deposit adresss and input how much you wish to send.